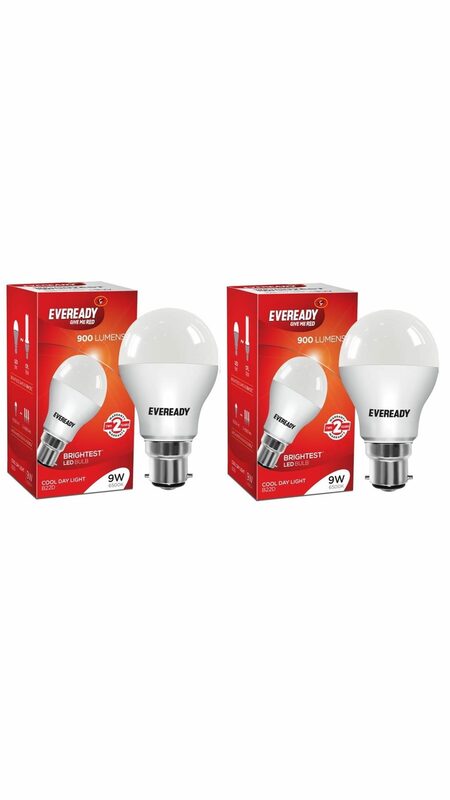 Get the bright day light even during night with these LED bulbs from the house of Eveready. These 9 watt bulbs consumes less electricity and provides bright light. 18002003445;To avail the warranty : Call either on 1800-200-3445 (toll free) or drop an email to eveready.co.in with customer's name, address, contact details and a copy of product purchase invoice. Experience the brightest light with Eveready LED bulbs. The light is ideal for homes and commercial spaces. The best quality product design and exclusive components ensure consistent output. Outlined with exclusive features, the Eveready LED bulb is highly durable and long-lasting. Eveready LED bulbs are designed to match your requirements. Wider the area of a room more should be the wattage of LED bulb. The bulb buying information will guide you suitable wattage respective to the room size. Bulb Bases that you Must Know! B22 LED bulb is most commonly used bulb base type in India. This type is also called a pin type bulb holder base or bayonet pin base type. The bulb for this type of a holder has a diameter of 22mm. This type of bulb is also known as standard edison screw type bulb. This bulb has a diameter of 27mm. Generally, the bulbs have right-hand threaded metal bases which screw into matching threaded sockets. Choose the light that perfectly suits your space. A light bulb that produces light perceived as yellowish white has a color temperature range of 2700K-3500K. As the color temperature increases to 3500K-5500K, the color of the light appears less yellow and more white. When the color temperature is 5500K or higher the light produced appears bluish white. This LED bulb from the house of Eveready has durable product design and reliable components thereby ensure longevity. At Eveready, we aim to provide brightest LED bulbs at pocket-friendly rates. The light consumes less energy and hence saves more cost. This product comes with 12 months Manufacturer Warranty from date of invoice. To Claim Warranty:Customer can either dial on 1800-200-3445 or 1800-102-4041 (toll free) or can drop an email on consumercare@eveready.co.in with customer's name, address, contact details and a copy of product purchase invoice.